Can somebody run LZ for an analysis of the position below (Black to play) to check the difference with Leela 11 (see pic)? Just a couple of minutes. I hope LZ also offers something similiar of an Analysis Window like Leela to see deeper into its thought process. Looks like it's hard for Black to go wrong in this position. Well, first it's interesting how LZ evaluates this position since Leela thinks it's White's favour already. Secondly, I like to see what LZ proposes: g3/f3 or d5/c5 or something completely different. I think d5 is best here, but I have a feeling a brutal tenuki might be even better. Thx a lot. Wow, would never have thought of playing on the right lower side. Is 100K playouts much or little in terms of analysis depth? It's a lot. LZ training games and matches are played at 3200 playouts. Pippen: 1 LZ playout is worth a lot more than 1 Leela simulation (and not just because LZ is stronger), they aren't equivalent as a "unit of work". Maybe a factor of 10 difference? Also LZ's principal variations stay sensible far deeper into the tree whereas Leela's tend to turn to junk maybe 6-10 moves deep. Maybe interesting to see what White should have answered instead of M3 and Leela's ideas. In any way my Split-Fuseki seems far more competitive than even I thought. It basically loses nothing, even in a scenerio like here where virtually nobody except me ever plays it (one pro game ever^^). I can't wait till LZ is available without all that installing mambo-jambo to explore it myself. BTW: Any idea when LZ might be available like Leela 11 with or without payment? Did the developer say something? 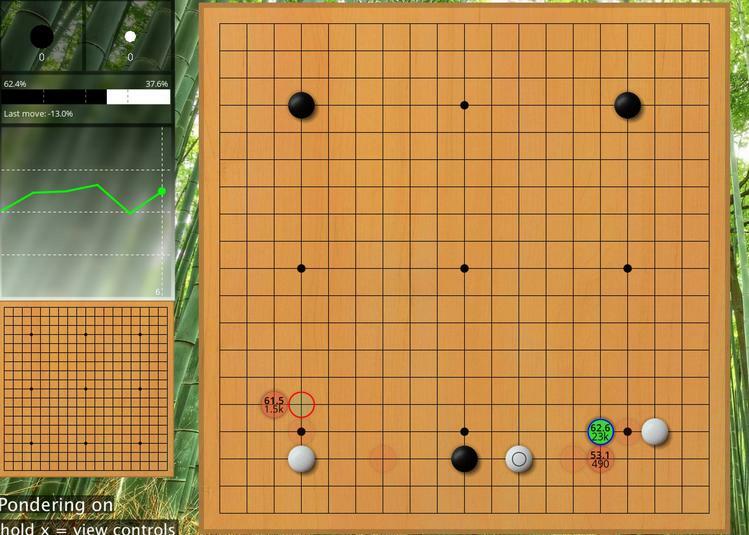 Elf obviously thinks AlphaGo is majorly winning around the middle of the game, but after Lee Sedol's "divine move" (of 78), which doesn't actually work, Elf still thinks AlphaGo is winning. And while it's not Elf's top choice, AlphaGo's response still has a 95% or so winrate. In other words, even after showing Elf AlphaGo's mistake, Elf, like AlphaGo, still thinks that black was winning the game. As the game plays out, like AlphaGo, Elf's winrate dropped significantly when it finally realized that the result had changed. So these types of analyses are interesting, but it's also interesting to note the mistakes that they make sometimes. LZ wants to attach at C4, and her second choices are to make a shimari in the top left (both directions are considered C13, C14, F17 or G17). I am interested in the sequenze 8-32 purely for White. 1. Where is the first time Leela would have played differently as White. 2. After 32, if Black plays F8 White cannot kill the 6 black stones inside IMO. What sequenze would Leela play to F8 and how does it see White then? The main line suggested by Leela can be seen in the small board on the left.